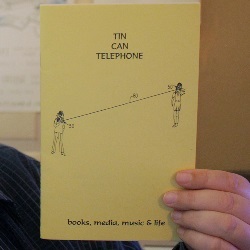 Tin Can Telephone was previously known as Paper Radio, which was mainly a media and radio fanzine. Now in its fifth incarnation, anything goes. In the first issue, there are three essays, one of which is a very insightful and personal glimpse into Fred’s transition from an angsty young adult into the next chapter of his life. Other features include Concert Reviews, a book review of Steve Diamond’s “What The Trees Said”, and Fred’s Question of the Day. As Fred is my father, I do have a bit of personal bias when it comes to his writing. Like most of his zines, Tin Can Telephone is Digest-sized with a few visual aids to compliment the entries, and 20 pages.